Leader of Opposition Winnie Kiiza addressing journalists at Parliament this morning. Photo by Beatrice Leni. Members of Parliament were treated to a spectacle at the August House this morning when security personnel blocked them from driving into Parliament. 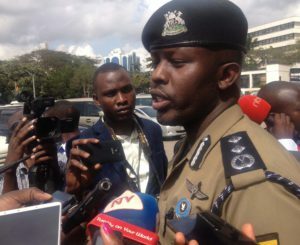 Dozens of police officers from the Counter Terrorism unit and anti-riot police have been deployed at Parliament ahead of the anticipated tabling of a motion by Igara West MP, Raphael Magyezi, seeking leave of Parliament to draft a bill on constitutional amendments. Some legislators including Kasese Municipality MP Robert Centenary arrived at Parliament as early as 8 am only to be blocked from driving in, apparently on orders of security. Centenary engaged the police in a war of words but he was still blocked from accessing the premises, except on foot. Several MPs were seen at the main entrance of the gate directing their drivers to drive away towards the National Theatre, where parking had been secured for them. 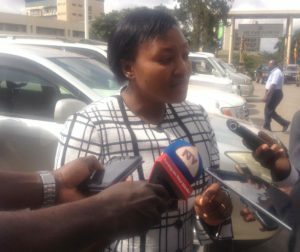 The Leader of Opposition in Parliament, Winnie Kiiza expressed disappointment with Parliament’s leadership for the action, wondering why it was only today that their vehicles could not access the five-storied parking lot at Parliament. Kiiza said the move is aimed at muzzling and intimidating legislators who are against the motion by Magyezi, expected to be tabled this afternoon. “What kind of country are we living in? It is unfortunate that MPs are being blocked inside here and the reason is they want us to walk inside…taxpayers coughed a lot of money to build a parking lot at Parliament. We need to be told where there are other new MPs who have been added,” Kiiza angrily told journalists. Kiiza also criticized the President for using intimidating tactics to pass the age limit removal motion. “If President Museveni thinks that the lifting of age limit is going to give him long life, it is unfortunate. Museveni should know that there is life after this motion is passed. Taking Ugandans for a ride is unfortunate,” she added. Manjiya County MP John Baptist Nambeshe said the deployment will not deter them from expressing their views on the floor of Parliament. Kawempe South MP, Mubarak Munyagwa on the other hand said it is unfortunate that a whole arm of government can execute its duties under siege. “We are waiting to see if President Museveni will bring this battalion of soldiers inside the chambers of Parliament,” Munyagwa said. Kampala Metropolitan Police commander Frank Mwesigwa addresses journalists at Parliament today. Photo by Beatrice Leni. Explaining the deployment, Kampala Metropolitan commander, Frank Mwesigwa said the deployment will be in place to ensure security in the city centre. He warned those planning processions to Parliament that they will be arrested. Commenting on Lord Mayor, Erias Lukwago’s arrest this morning, Mwesigwa said it was because he was mobilizing people to march to Parliament to disrupt business. “Lukwago had mobilized massively with a clear message to incite violence and ferrying people to Parliament and the city centre,” Mwesigwa said.